In order to comply with EU tax regulations, starting from April 16, 2018 for new customers and June 1, 2018 for existing customers Kinsta has started charging VAT (Value-Added Tax). This article shows you how to add your tax number at signup or via MyKinsta at any time after you have registered with us. 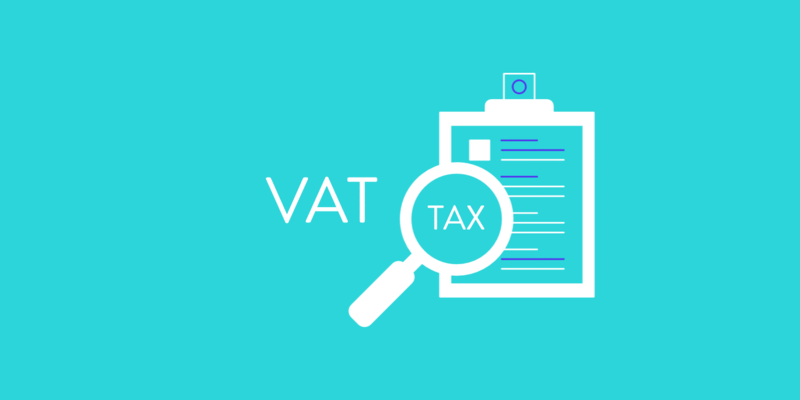 To read about what VAT is, how this affects you and how Kinsta handles VAT read our general VAT Information guide. Only companies are issued EU VAT Numbers so make sure you have company selected using the account type radio buttons. 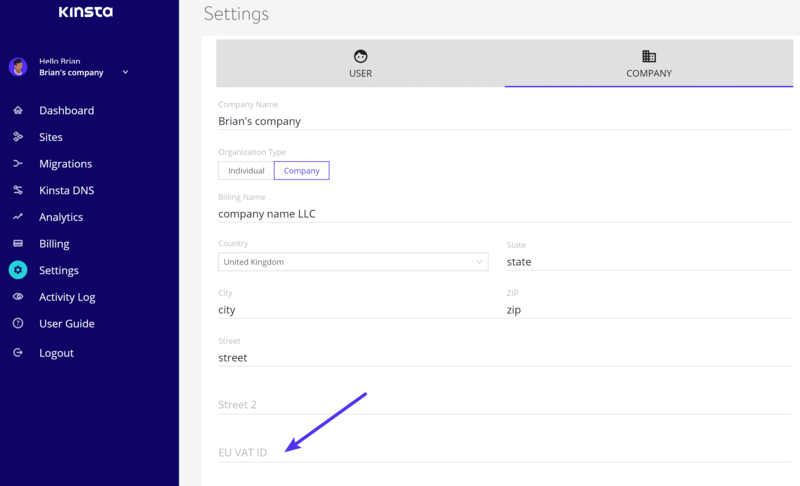 Once you have company selected you will be able to set your company name and EU VAT Number. Paste your EU VAT Number into the field. Note that this can take on many formats as each member state determines their own format. See the EU VAT Number Format Guide for more information. All EU VAT Numbers start with the issuing country’s two-letter code. When you click out of the field or submit the form your EU VAT Number will be validated using the VIES system. This system is the EU’s official service for checking the status of a VAT number. Your VAT Number will only be accepted if its format is valid and it is active in VIES. Once you have entered a valid VAT Number the VAT and total amount will be adjusted – you will not be charged VAT. If you did not have a VAT Number at the time of signup you may add it at any time. Go to Settings and click on the Company tab. 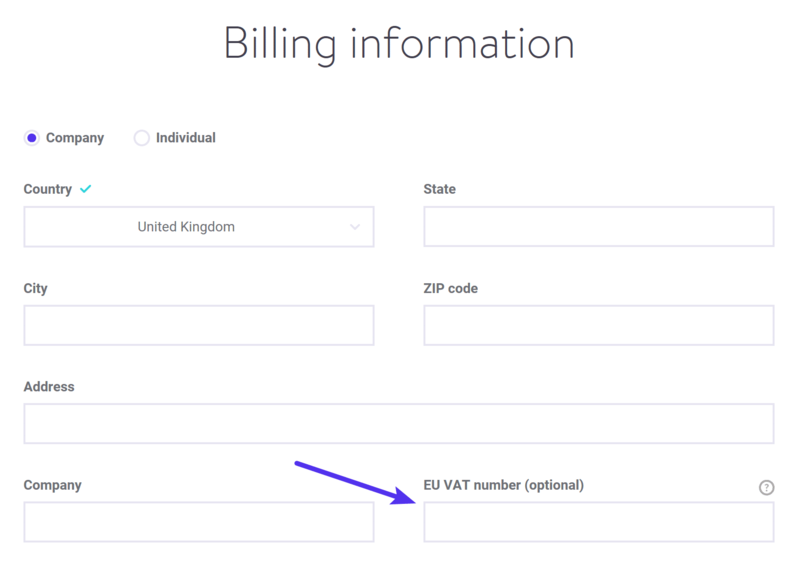 There is an EU VAT number field in the form. Enter your VAT ID there. It will be checked by the VIES system and saved in MyKinsta. If your number is invalid we will let you know. Will My VAT Be Refunded From Past Invoices If I Enter My VAT Number? Unfortunately not. Being in possession of a VAT Number is not sufficient to fulfill the EU’s data requirements. You must be in possession of a VAT Number and you must supply it at the time of purchase. This means that we can not refund the VAT from past invoices.